With its clean look and hint of nostalgia, ticking stripe fabric is a down-to-earth, decorative workhorse. Quintessentially simple, traditional ticking features a muted stripe in a color such as red, blue, brown or black on a light, neutral background. A twill of tightly woven cotton or linen, ticking was originally used as a cover for mattresses and pillows to prevent the spiky quills of down feathers from poking through. Today, any striped design on a light background or even a combination of colored stripes is often referred to as ticking. The stripes can be narrow, wide or a mix. Some stripes are actually printed onto, not woven into, a lighter-weight material. 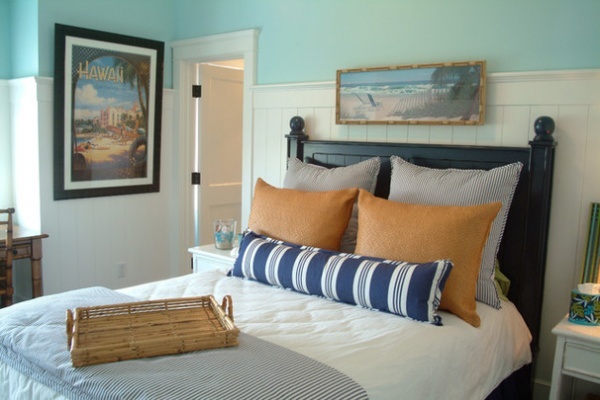 These handsome pillows feature a combination of blue stripes on linen. Although the master of utility, ticking has shed its pragmatic stereotype and can show its stripes in other areas of the home. Here are six ways you can do just that. Decorating grande dame Sister Parish has been credited as the first to introduce ticking as a decor fabric. She made slipcovers from the humble material back in the 1940s. 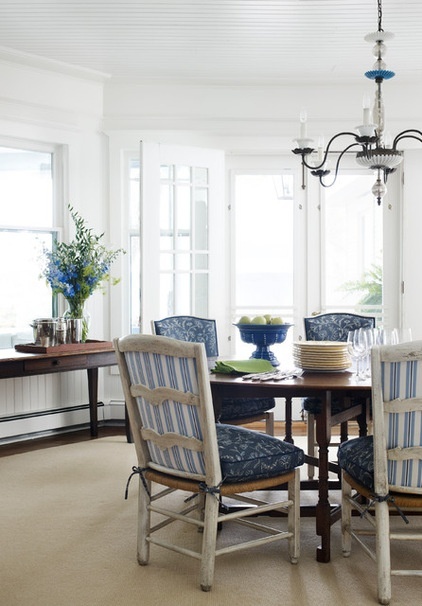 Because traditional ticking is a heavier woven fabric, it’s a perfect choice for slipcovers since it’s sturdy and will hold up to repeated washings. Check the manufacturer’s cleaning specifics first, but make sure your fabric is pre-shrunk before you have slipcovers made, by washing it in hot water and drying it on a high setting. Otherwise, it’ll feel like you’re putting a pair of skinny jeans on your cushions after they’ve overindulged at the buffet. 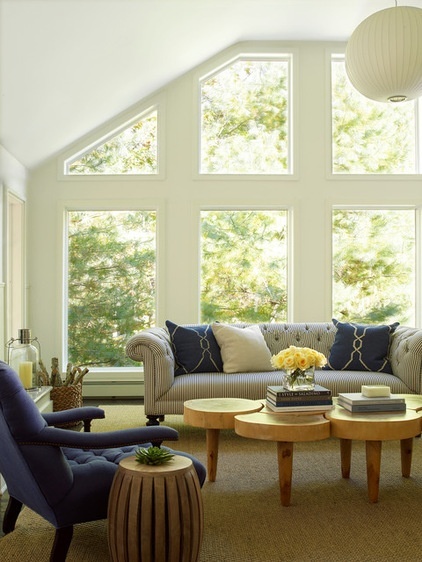 Design improvements have been made recently in outdoor fabric, and some folks are starting to use these fabrics on standard upholstery pieces. 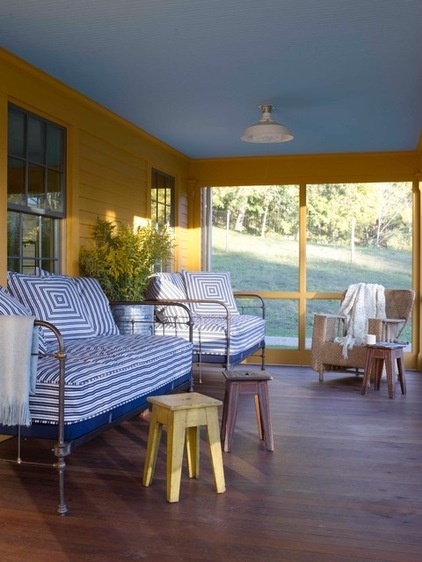 Designer Heide Hendricks says that for the project shown here, the mattress slipcover was made from an outdoor fabric in a navy and white ticking stripe design. 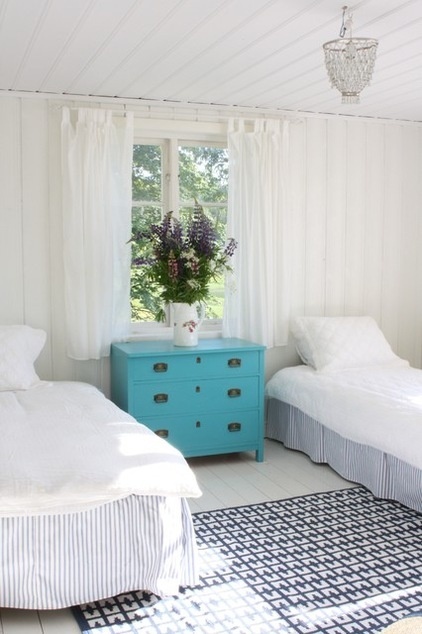 The larger blue “stripe” at the bottom is a fabric-covered low-profile box spring. 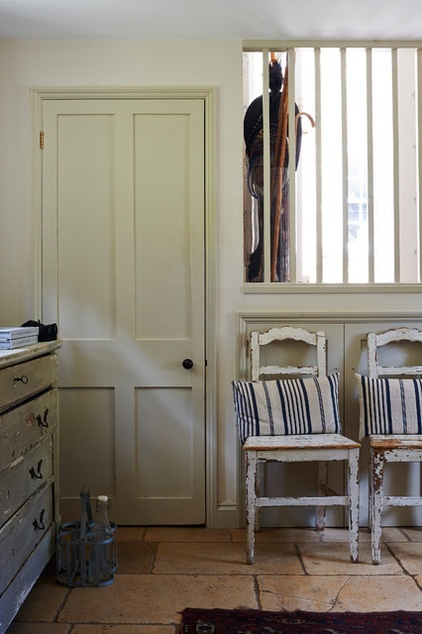 Stripes are striking on windows, especially in simple fabric shades or drapery panels. 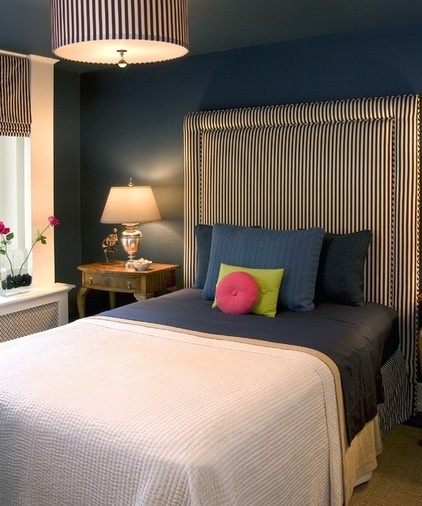 If oriented vertically, the stripe makes the room appear taller. Like most window treatments, ticking should be lined to protect against sun damage, provide some insulation and create a ground to enhance the striped pattern. If you’re looking for something more permanent than a slipcover, ticking makes a wonderful upholstery fabric. Just make sure it’s a heavyweight woven type and not a lightweight printed version. This Chesterfield sofa stuns in ticking stripes, and while it adds pattern, it doesn’t visually overwhelm the space. Keep in mind that smaller stripes can create a graphic vibration to the eye. Also, any interruption to the stripe pattern, such as by something that has spilled on the fabric, will be more noticeable than on other patterns, such as an allover floral design. Ticking may have humble origins, but it can always be dressed up. This settee has been beautifully finished at the bottom with antiqued nailheads. Another popular option is using welt made from contrasting fabric or a self-welt on the bias so that the stripe on the welt is angled. There’s a good example of biased welt on the pillow example later in this story. 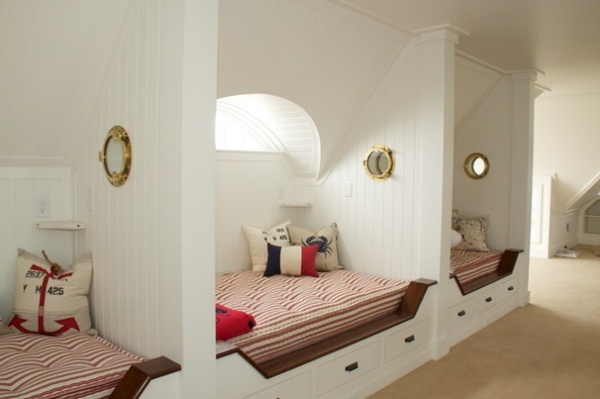 Ticking looks great on upholstered headboards too, especially those with a simple, boxy shape as shown here. If you like ticking but are wary of committing to a large piece like a sofa, there are several ways to use it more sparingly. Consider upholstering only the backs of dining chairs or perhaps removable cushions. Pillows are the best way to try out fabrics without too much investment. This bed mixes two large-size traditional ticking pillows with a more graphic, large-scale lumbar pillow. 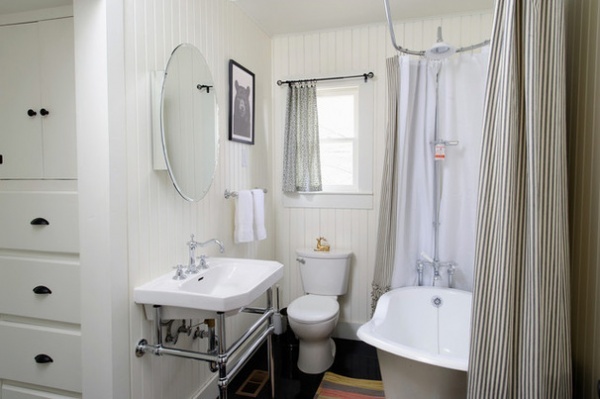 Ticking gives a clean look to a bathroom, as evident in the shower curtain made from black ticking shown here. Because ticking can be heavy, make sure you don’t have flimsy shower curtain rings. You want them to be sturdy enough to handle the weight of the material, especially if you have a taller-than-average curtain. Making a bed skirt from ticking fabric is a way to subtly introduce pattern that doesn’t fight with other components of the room. 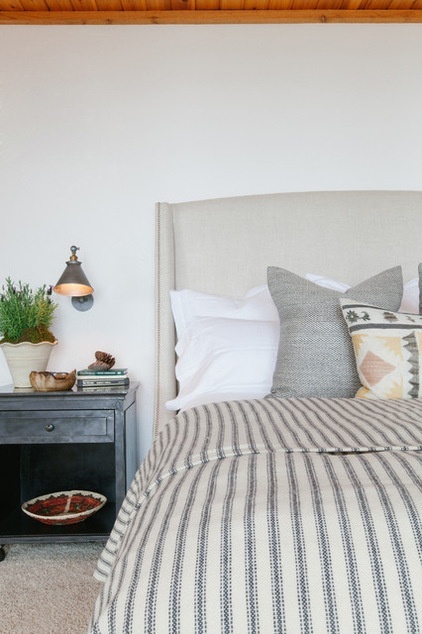 Though this bedroom has a restful white palette, ticking is flexible in that it works particularly well with more pronounced patterns, such as florals. Being a utility fabric, ticking is quite easy to find and is one of the most inexpensive fabrics around. You get a lot of bang for your buck. 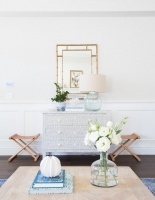 You can find varieties in the Houzz Shop and at most local fabric stores. You can also find it in funkier colors, like lavender and pear green. Most ticking fabric is between 54 and 57 inches wide. Expect to pay between $12 and $25 per yard for traditional ticking designs. Multicolored and mixed-stripe fabrics will cost more, depending on the manufacturer.